The first time I tasted quinoa was in the mid-1980’s. I’d just moved to Vermont and was discovering all kinds of new foods. It was a thrill. I remember eagerly looking for recipes for it, but in those pre-Google times, the only thing I had to go on were the directions on the package. So I started experimenting on my own. 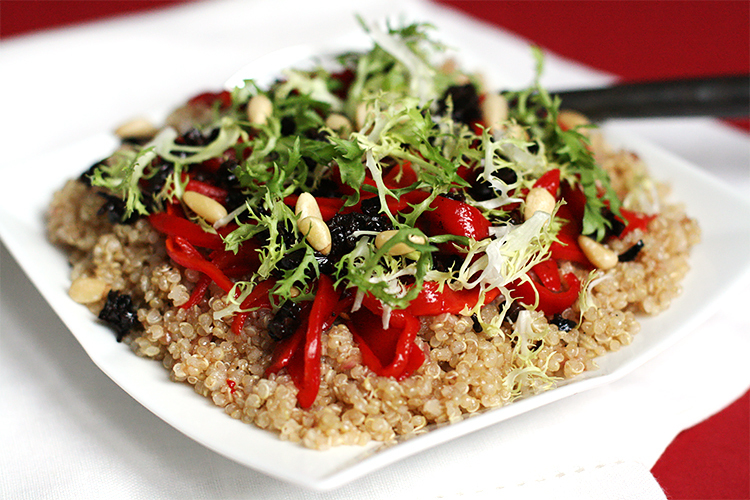 Before long, quinoa was a favorite in our household; it was on the menu at least once a week, in one form or another. For me, the most seductive thing about quinoa is its texture — it is so refined! And although I often serve it in place of rice, I also love creating more sophisticated recipes for it. That’s how I came up with today’s dish. I wanted to make an elegant appetizer, something I could serve at dinner parties — something that would highlight this little seed’s delicate shape and subtle flavor. The best part, though, is that this recipe is extremely versatile. With a little attention to detail, it is indeed transformed into the stylish appetizer I had envisioned. 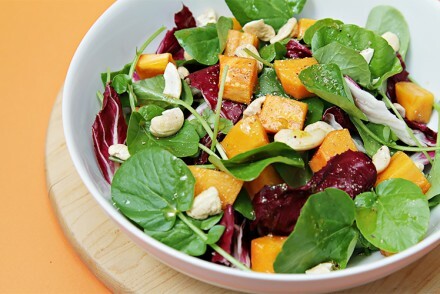 And with a little nonchalance it becomes a super-easy salad served family style. Either way, one thing’s for sure: this dish is just plain delicious! A manzanilla sherry from Sanlúcar de Barrameda in southern Spain is marvelous with this appetizer! 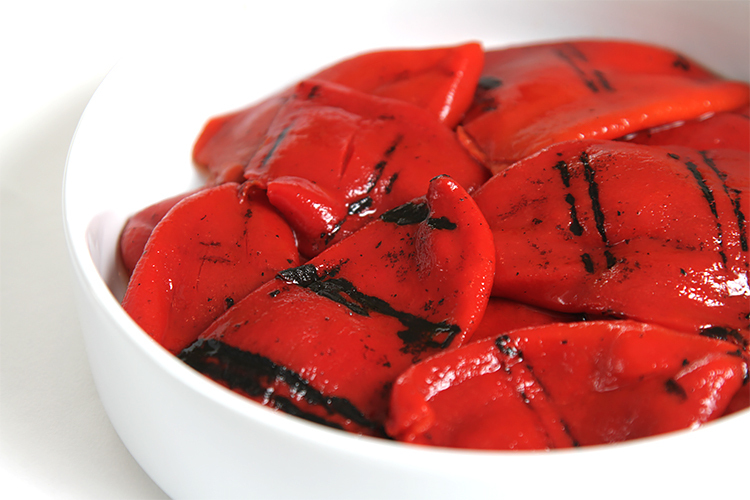 The wine’s complex flavors work well with the Piquillo peppers and the cured olives, while its acidity stands up to the vinaigrette. Of course, a dry rosé would be delightful here too. Step 1: To make the vinaigrette — Place all ingredients in a small bowl. Whisk until well blended and set aside. Step 2: Toss the quinoa with two thirds of the vinaigrette and mix well. Spoon the quinoa mixture into the ramekin and press with the back of a spoon to pack it tightly. Invert ramekin in the center of a plate and gently lift it off. It will create a small mound. Top with the Piquillo pepper slices and then a dollop of the chopped olives. Garnish with a few frisée leaves and some pine nuts. 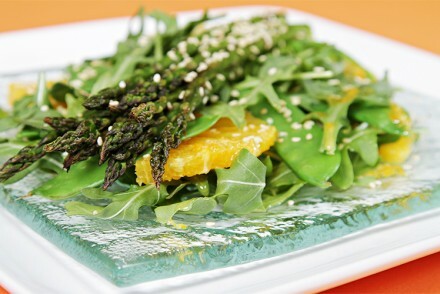 Drizzle with the balance of the vinaigrette and finish with freshly ground pepper to taste. Serve immediately. Cook’s note: To serve the quinoa family style, toss the quinoa with two thirds of the vinaigrette and mix well. Place quinoa in a serving bowl. Top with the peppers. Sprinkle with the chopped olives. Garnish with the frisée and pine nuts. Drizzle with the balance of the vinaigrette and a little black pepper and serve. Love this recipe. I’m also a big fan of quinoa so I’ll try it. Lovely pictures. 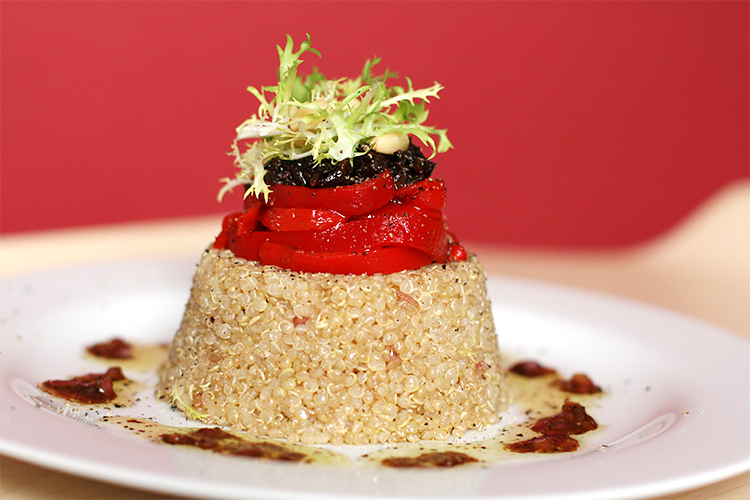 Yum, this looks fantastic – I love quinoa, and I love piquillo peppers – bet they make a wonderful combination! I do really like the recipe!! I just started following your blog and I already admired your creativity and dedication! Everyting is great! Love from Turkey! Ceren, Thank you so much for your kind words and for stopping by! It is always wonderful to meet another foodie. Love right back at you from Piermont! I do hope that one day I’ll get to visit your beautiful country. Thanks for this recipe Viviane. I have some Quinoa left over from one of your other recipes. You did an amazing job on this recipe. Great photo’s! Looks very elegant and appetizing! Wow! it looks Yummy, i wish i can cook that deliciious food. Igot an idea, why don’t i told my girlfriend to made it? Yes, thanks for this recipes. Quinoa! i’m coming!..Nyam,,nyam.. Lovely photos! Quinoa is great, it is so versatile! 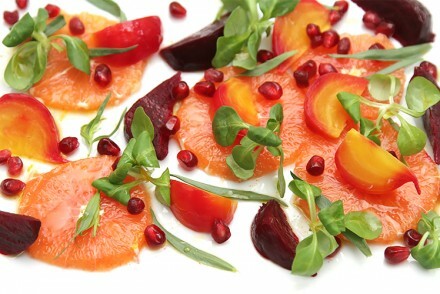 What a lovely recipe and the presentation and photos are excellent. It looks delicious as well as healthy. gorgeous dish! that last photo makes me want to grab myself a plate and just eat! Beautiful presentation and I’m always looking for quinoa recipes! What a beautiful presentation! I am a big fan of quinoa and I love the flavors that you used here. I know this dish must taste great and I love the presentation! Inspiring! Did you know that you can eat quinoa without cooking it but by germinating it? 8 hours in water and a days in a drainer, it will be ready to be eaten as is. In a salad it will be perfect like in a taboule. Try it. Yes, it is elegant! And i love that grater as well. That is just beautiful either way! Quinoa is one of those things that I know I love and I just don’t use enough. I just need to get it in a regular rotation. This is a good place to start! Thanks! This recipe looks fantastic and I can’t wait to try it. Beautiful — and I also like using a microplane for garlic for dressings; makes it so easy to incorporate and no big chunks of raw garlic! The colors on this are fabulous — gread for year-round cooking. 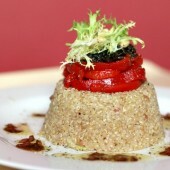 I love the presentation of the molded quinoa with piquillo peppers on top. I agree – it’s definitely very versatile, not to mention super-healthy and tasty! I am in love with this recipe! Aside from being amazingly healthful the flavors here will help me forget that it is! Well done! We love quinoa too — I’m not sure why it’s not more popular. Maybe because no one knows how to pronounce it? Beautiful pics!